The categories of Break Dance are: Solo and Crews. 1. Music: Organizer’s music in Break Dance style. “knock-out-system” (5 – 10 minutes each battle). variable footwork, etc., including different variations of these figures, elements and movements. movements in various combinations are all expected aspects of Break Dance routines. twice are only counted once. If repeated, the best attempt of the two will be marked. 5. Acrobatic Movements: Permitted as outlined under General Provisions for Street Dance. 6. Forbidden Movements: Elements and figures that, according to the dancer’s ability, are too difficult or that could lead to injuries or loss of life. 7. Stage Props: As applicable for this discipline. For Teams it is also allowed to use requisites. 8. Break Dance competitions are not organized in the Children age division. will be organized by giving the points from 1-10 and letters that are needed for the next round. decide about their choice, showing the hand to the dancer they would like to see as a winner. and Scrutineer control the showing of hands. If there is 10 to 17 competitors in the 1st round, Adjudicators will qualify only 8 dancers, 2 of class A (4 points), 2 of class B (3 points), 2 of class C (2 points), and 2 of class D (1 point). Then in next round there are only 4 battles (A1/D8; B3/C6; A2/D7; B4/C5). The winners of these four battles will go on to two battles and finally will be one battle for 1st place and one battle for 3rd place. If there is less than 10 competitors in the 1st round , Adjudicators will qualify only 4 dancers, one of each class and then there are only 2 battles (A1/D4 and B2/C3); followed by battles of the winners of previous 2 battles (one battle for 1st place and one battle for 3rd place). In the Break Dance battles solos only three battle “entries” should be necessary. 2. Music: Teams = Crews may use their own music in the first round. Organizer’s music in Break Dance Style will be used in the final round. 3. Duration of Performance in the first round (Show): 150-180 seconds (2:30 – 3:00 minutes) of each team’s/crew´s performance may be danced using the team’s/ crew´s music. In case that the music is too long or short the crew will be disqualified. 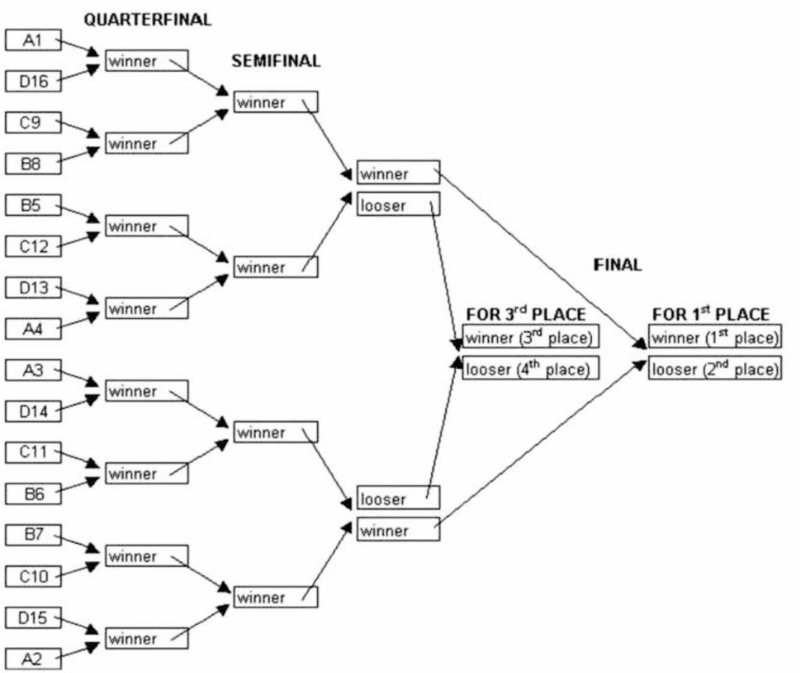 The “Semifinal-Battle” (3. and 4. place) will last about 5 – 10 minutes. The “Final-Battle” 10 – 15 (20) minutes, according to the Supervisors decision. The last minute will be announced. 5. Typical Break Dance Elements: Same as for Break Dance Solos, plus: Acrobatics should have some style continuation. Choreography for the exhibition to the team’s own music must be a clear performance of a team, not just a demonstration of unrelated solo performances. Musicality,difficulty of movements and figures, originality and team variability will all be highly evaluated. Synchronized movements, shadow standing, mirror positions and smooth transitions of these components from one into another, along with choreographic variability and work with space will also be evaluated. All typical elements of Break Dance should be performed – Styles - Pop Locking - Power moves – Electric Boogie. 6. If one crew disturbs another team’s performance or endangers another team’s safety, a loss of evaluation points will result. 7. The final ‘battle’ portion of each contest shall consist of individual performances of dancers from the competing crews in which each dancer must dance his or her solo part at least one time, and the crew´s performance will be judged as a whole. 8. Based on the first round results, the Chairperson of Judges will determine the order of “battles” between 1st - 2nd ranked crews and the 3rd - 4th ranked crews. 9. All other rules are as outlined under Break Dance Solo. First round is a show of crews who will dance to their own music. The Adjudicators will evaluateand select the four best crews. The Adjudicators give the best crew 4 points (A), the next best crew 3 points (B), the next best crew 2 points (C) and the next best crew 1 point (D) .Only the 4 best crews will battle to the Organizer’s music (3rd against 4th and 1st against 2nd). If there are more than 8 crews in the 1st=preliminary round, a Supervisor together with a Chairperson of Judges may decide to ask for additional crosses for crew/crews on the next position after 4 best crews (cross means placement). When asked to select Adjudicators for this discipline, each nation should only invite Adjudicators who are very experienced in Break Dance and Electric Boogie. This type of VIP Adjudicator would include past champions, celebrity performers, teachers and choreographers who are all considered experts in this field. This note is intended as a guideline only, and is not a rule.